Fine antique Baltic gilt brass and milk glass six-light chandelier. Elegant Baltic six-light gilt bronze and crystal chandelier. 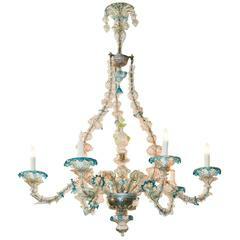 A fine Baltic chandelier with 'Baltic' blue glass and clear cut-glass dressings, arms and pendants. The metal work of silver plate. Six-arms in total.